The weather recently has been cold and crisp. It seems like it's been couple of years since we had a good frost with sub zero temperatures continuing into the day. It has been a pleasure harvesting vegetables under a blue, cloudless sky even if our toes were a bit cold. Hopefully it will kill off some slugs! During November Mark went on holiday for 3 weeks. While we managed without a hitch, it was a lot of work as we were a bit short staffed, but with the help of Sebastian, our regular volunteer and Kees from the Micro Dairy next door we managed to get by. On top of all our daily tasks there is a lot of organising: who gets what, what weights and numbers to pick, what orders there might be, new drop off locations etc. It did remind me just how much planning work Mark puts into the share each and every week. It is no small feat to put out a full share every week without fail... ever! The cows and pigs have come into the barns for winter. During the winter our days are framed by feeding the animals at each end of the day. There is a lovely feel to the routine of feeding out hay to the cattle first thing in the morning and then at the end of the day. It happens twice a day, every day till spring; when its equally nice to let them out again. By the way our new bull has finally got a name and it's called Fergus. Thanks for all the great name suggestions that you shared on our facebook page. Our 'together Wednesday' (work days) have been going well. We have a regular group of very dedicated people coming along every Wednesday from 1 0am. During the summer the work was predominately weeding, but recently we have also harvested a lot of root vegetables for the share and to store. During the time that Mark was away their work was invaluable, thank you. I would like to thank Kris who helped us until October and Richard who will be with us until Christmas. Thank you for all your help this year, it was a pleasure working with you. all the best for the future. I would also like to say a fond farewell to Page, Page has been our apprentice working with us for the last couple of years. It has been a real pleasure to have you as part of the team. I've really appreciated your input both on a practical level and as a member of the core group. I wish you all the best, and please visit us from time to time. The cold snap in November has been rather a shock to the system. This was the coldest weather we have experienced for four years or more and it caught us out a bit. Unfortunately some of the root vegetables were damaged by the cold frost (though many were unaffected). Most of the green winter vegetables such as cabbage and leeks etc. 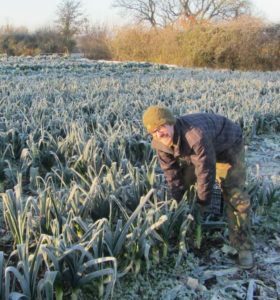 can tolerate very cold weather, as can the parsnips and swede, but most of the other roots can’t, and so we lift them and store in an insulated room at Brookthorpe. We don’t harvest the carrots to store though; they just don’t keep so well there. If the weather threatens to turn very cold then we cover the carrots in the field with straw and plastic to insulate them. This does attract the mice though, who for some reason enjoy living in a warm dry place with an endless supply of food. I often write at this time of the year about carrot root fly. This small fly lays its eggs on the carrots in the summer. The maggots hatch out and then feed on the roots throughout the autumn and winter, tunneling into the root. We cover the carrots in the summer with a fine net to keep the pest off but inevitably some do get in. This year, (touch wood), there doesn’t appear to be too much damage, but we may discover more as we harvest the carrots later in the winter. We try our best to grade them out when we harvest them but you may well discover some carrots in your share with these most annoying tunnels in the root. Well that’s all a little bit on the gloomy side so I must say that we have a lot of fine vegetables for the winter - some in store (plenty more squash), plenty in the field (leeks, purple broccoli, cabbages etc) and some in the polytunnels (spinach and mixed salad). We hope you enjoy them over the winter. I was away from the farm for three weeks in November visiting my family in Australia. Sam and Rich shouldered the extra workload while I was away... thank you so much for that... it was so nice to be able to have a holiday and know that everything will be okay. Finally, I would like to thank Rich and Kris who have worked with us over the summer. Thank you for all of your hard work and for your conviviality whilst doing it. I wish you all the best in your future endeavors.